If you don’t see it on the list, don’t hesitate to ask! Acetate – a stiff, matte film which exhibits: rigidity, dimensional-stability and ink-receptivity. Aluminum Foil – a very thin, sheet-metal with pressure-sensitive adhesive. Coupon – a removable label which has a redeemable value and contains pertinent information such as prices, dates, bar codes, etc.. We do 1 sided, 2 sided and 3 sided coupons. CSA (papers & films) – Canadian Standard Association. Destructible Material – a tamper-proof material. Will tear apart in little pieces if the label is tampered with. Direct-Thermal (papers & films) – a face-stock specifically designed to accept heat-activated imaging from a Direct-Thermal printer without the use of a special ribbon. EDP or Smudgeproof (papers) – Electronic Data Processing; pressure-sensitive paper for use on computer printing equipment. Fluorescent (papers) – a specialized paper that is evenly coated with a fluorescent pigment. ALCOP carries Red, Orange, Pink, Green and Chartreuse (greenish-yellow). High-Gloss (papers) – a highly-polished finish (i.e. Kromekote). Holographic Leaf – a patterned, photo-sensitive material or embossed polymeric film. 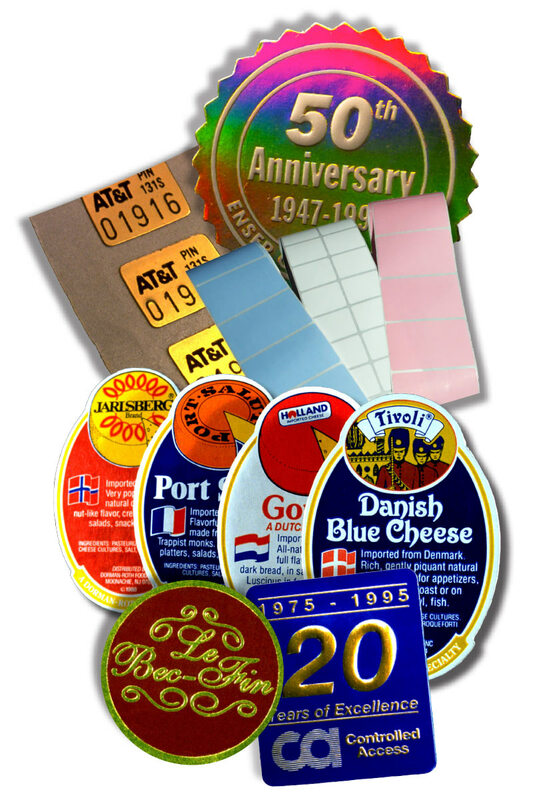 Hot-Stamp Leaf – a colored, metallic film which transfers onto label material through heat and pressure. Kimdura Film – a matte-white, multi-layered, polypropylene film for dot-matrix and thermal-transfer printing. Good for outdoor exposure. A trademark of Neenah Paper. Lamination (films) – a plastic film bonded by an adhesive to a printed material for protection or appearance. Laser (papers & films) – a pressure-sensitive material that accepts laser toners and temperatures and is therefore suitable for laser printing. Usually supplied on a lay-flat liner to reduce undesirable curling in the printer. Lexan – a polycarbonate (thermoplastic), hard film. A trademark of General Electric. Matte-Litho (papers) – a no-gloss finish. Medical Labels (papers & films) – the various, specialized materials that are used in the medical and pharmaceutical fields. Name Badge – a label with an adhesive made specifically for temporary use on clothing. Typically used for visitors, special events, etc. Nameplate Film – a permanent film designed to withstand exposure to adverse conditions. Nameplates usually contain critical information such as serial numbers or other codes, component information, emergency references, etc. Often applied to electrical components, industrial parts or machinery. Paper Foil – a foil-laminated paper that can be printed, hot stamped and/or embossed. Piggyback – a pressure-sensitive, multi-layered construction consisting of: 1 top release-liner (with adhesive and face-material) 1 middle-release and 1 bottom release-liner with adhesive resulting in 3 layers on one printable label. The full label can then be applied complete with backing – while also permitting the separation & removal of each of the layers for further applications. Piggyback (Middle-Image) – same as piggyback except the middle release-liner also has adhesive with a face-material resulting in 2 printable (or imprintable) layers on one label. The full label can then be applied keeping both printed layers intact – while also permitting their separation & removal or further applications. Pinfeed (papers & films) – a pressure-sensitive material for use by printers that have round or rectangular margin holes which are used to maintain the register of the labels while they are being printed (or imprinted). Polyester (films) – a strong film with good resistance to moisture, solvents, oils, etc., (i.e Mylar – a trademark of DuPont-Tejjin Films). Polypropylene Film – a strong, stretchy, plastic film. Durable and resistant to high-temperature. Semi-Gloss (papers) – a (one-side) coated Litho material with a partial sheen. Smudge-Latex (papers) – paper characterized by: strength, folding or curving endurance; resistance to penetration by water; flexibility, durability and resistance to abrasion. Specialty Labels – Specific-purpose labels with isolated use; such as bone-marrow or other white-room labels. Static Cling (films) – a property that is induced into film (clear or white); which enables it to grab onto a smooth, clean, surface without using pressure-sensitive adhesive. Often used on substrates (item surfaces) that can become damaged too easily by adhesives or where residues may be a concern. Typically used on windows and other glass products. Tag Stocks – a card-like material – usually without adhesive. Used in many forms of merchandising, packaging, system serving, etc. Thermal-Transfer (papers & films) – a face-stock specifically designed to accept heat-activated ink that is transferred from the specialized, mono-colored ribbon used on a Thermal-Transfer printer. Tyvek – a polyolefin material which is often used where a very high, tensile-strength and flexibility is required. Trademarked by DuPont. Vinyl Film – a tough, durable, plastic film having excellent resistance to oils, chemicals and many solvents. Void Material – a tamper-evident material. When the label is removed the term “VOID” will be left on the product – thus showing it has been tampered with.